Full mouth reconstruction is a comprehensive, customized approach to improving your complete oral health and the appearance of your smile. Experienced dentist Dr. Keith Ogawa will work closely with you to determine which combination of dentistry treatments can best meet your unique needs. To meet personally with Dr. Ogawa and learn how he can help you achieve the strong, healthy, attractive smile of your dreams, please call Contemporary Dental Health at 503-636-4069. Our friendly, state-of-the-art office welcomes patients from Lake Oswego, West Linn, and Nearby Portland, Oregon. Why Choose Our Full Mouth Reconstruction Dentist? Full mouth reconstruction involves the combination of multiple restorative, neuromuscular and cosmetic dental procedures. The objective is to not only restore the aesthetic appearance of your smile, but to also strengthen the structure and functionality of your teeth. Full mouth restorations are often crucial for a patient’s overall well-being due to the interconnected nature of oral health. For example, if you suffer from a chipped tooth, it can lead to problems with your bite. Bite issues can cause chewing difficulties, which in turn can lead to excess wear on other teeth. 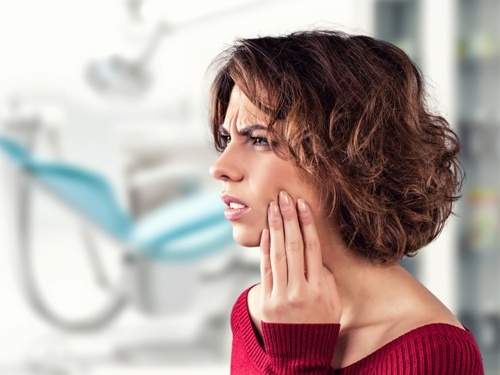 Misaligned bites are linked with a myriad of other issues, many of which are associated with problems such as headaches, jaw soreness, neck pain and even poor posture. Gum disease treatment: Healthy gums are the foundation for healthy teeth. Gum disease treatment may be necessary before some other treatments can even begin. Dental crowns: Crowns are used to restore strength and protect teeth that suffer from damage or decay. They are also placed with dental implants for tooth-replacement. Tooth-colored fillings: Customized to match the color of your natural teeth, fillings restore strength to teeth with cavities and prevent further spread of decay. Dental bonding: This treatment can address teeth that are broken, cracked or chipped. It can also protect teeth harmed by decay or trauma. Dental implants: The strongest tooth-replacement option available, dental implants replace your tooth’s root, providing superior strength and functionality. Sleep apnea treatment: If your oral structure is causing you to snore excessively, gasp for breath during slumber or inhibiting your ability to get a good night’s rest, sleep apnea treatment may be able to correct your sleep issues and improve the quality of your sleep. TMJ/TMD treatment: TMJ disorder involves problems related to the temporomandibular joint in your jaw. When this joint is out of alignment, it can cause a number of unpleasant symptoms, including migraine-like headaches, jaw pain, back problems and more. Invisalign clear braces: If you have tooth-alignment issues but don’t want to deal with the time, discomfort and unattractive appearance of traditional metal braces, Invisalign may be your ideal solution. Invisalign’s custom, removable, soft plastic trays are comfortable, convenient and virtually invisible. Smile makeover: Full mouth reconstruction is like a smile makeover, plus more. While smile makeovers encompass a wide range of cosmetic dental procedures to improve the appearance of your smile, a full mouth reconstruction may include a smile makeover in addition to procedures that deal with jaw alignment and dental health issues. Your first step toward a fully-restored and healthy mouth begins with a confidential consultation with Dr. Ogawa. He will carefully evaluate your current oral health, medical history and determine your optimal bite. He will then explain all of your treatment options and recommend a plan that best meets your goals. Improved self-esteem: When you feel confident in the health and beauty of your smile, the real you can shine through more easily. Your newfound confidence can help you feel better about yourself and improve the quality of your personal and professional interactions. Better sleep: Snoring and sleep problems are common symptoms of sleep apnea, and your oral health could be the culprit. When your quality of sleep diminishes, you are vulnerable to a number of related health issues. Sleep apnea has been linked to a heightened risk for obesity, diabetes, heart disease, high blood pressure and more. Enhanced concentration: Along with better sleep and improved oral health comes the ability to concentrate more easily on your daily tasks throughout the day. Improved oral health: Threats to your oral health such as tooth decay, plaque and gum disease are the result of unhealthy bacteria. Improvements to the health, structure and strength of your teeth and gums will enhance your overall oral health. Improved general health: The link between your oral health and general health cannot be overstated. A healthy mouth reduces your risk of cardiovascular disease, diabetes and even cancer. A strong mouth can also keep your food options open and increase your ability to enjoy a healthy, well-balanced diet. Proper nutrition can affect your energy levels, ability to exercise and your overall health. If you experience any of the conditions listed above, please contact Contemporary Dental Health today to schedule a personal consultation with Dr. Ogawa. He will fully assess your oral condition and design a treatment plan specifically for you and your unique needs. Total mouth reconstruction is unique to each patient. The procedures included in your dental restoration will depend on a number of factors. Your customized treatment plan may involve several treatments performed over the course of multiple office visits. The process begins with an initial consultation at Contemporary Dental Health. During this private, one-on-one meeting with Dr. Ogawa, he will perform a thorough examination, discuss your concerns and answer your questions. During this critical visit, Dr. Ogawa will design an individualized treatment plan based on your unique dental needs. The initial step in developing your dental restoration treatment plan is determining your optimal bite. Once your ideal bite alignment has been identified, Dr. Ogawa can better understand the cause of many related dental issues and develop a comprehensive strategy to correct the problem. Healthy teeth and gums provide you with the ability to eat, speak and function comfortably every day. Studies consistently find that oral health is not an isolated system in your body; it is an active driver of your overall well-being. Your mouth comprises a matrix of interconnected parts. When one part isn’t working well, other problems tend to emerge elsewhere. The state of your mouth’s oral condition is intrinsically entwined with your cognitive, respiratory and cardiovascular health. For example, if you suffer from temporomandibular joint disorder, you may experience back, shoulder and neck aches, ear ringing, eye pain and chronic headaches. Whether he is addressing jaw alignment, gum disease or tooth decay, Dr. Ogawa is committed to improving your oral health and overall wellbeing through safe and effective dental practices. At Contemporary Dental Health, we believe that your mouth is an excellent barometer for your general systemic health. Dr. Keith Ogawa is an experienced reconstruction dentist with a 25-year history of proven results. Over the course of his career, he has established a reputation for exceptional results and compassionate care. Dr. Ogawa knows that the key to optimal dental care never takes a one-size-fits-all approach. He will work closely with you to understand your unique needs and goals and work collaboratively with you to develop an individualized treatment plan. You will never feel pressured into any procedure and you will never feel rushed into making a decision. Your health, safety and ultimate satisfaction are out top priorities. If you suffer from multiple oral health issues, we invite you to contact Contemporary Dental Health today at 503-636-4069 to schedule an initial consultation with Dr. Keith Ogawa. We serve the Lake Oswego, West Linn and Portland areas of Oregon.